Discussion in 'iPhone and iPad Games' started by Benno, Nov 2, 2016. 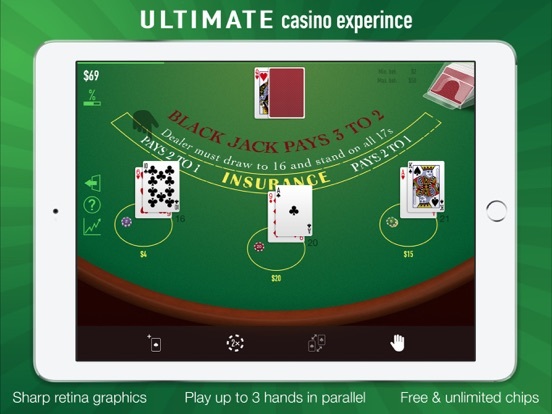 THE ULTIMATE BLACKJACK SIMULATION! Unlimited chips (no chip to buy in the game) • TRAINING MODE: improve your strategy by choosing your casino rules, initial bankroll and bet limits. • CHALLENGE MODE: try to win 10,000 chips starting with only 50! 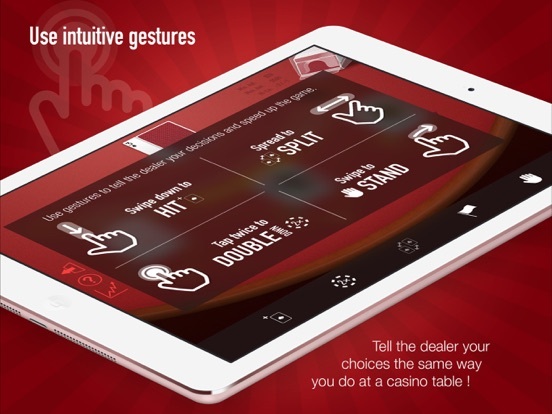 THE DEALER UNDERSTANDS YOUR GESTURES Use simple and intuitive gestures to play quickly: tap to hit, double-tap to double down, swipe to stand and spread your fingers to split the cards. You can play up to three hands in parallel. 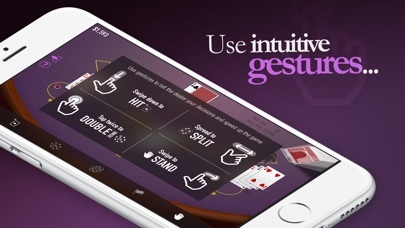 SHARP GRAPHICS, IMMERSIVE SOUNDS BlackJack Challenge features clear retina graphics with simple but efficient animations and sounds so you can dive quickly into the game. 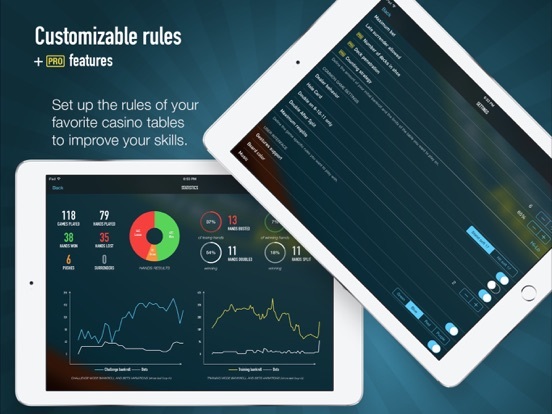 CUSTOMIZABLE RULES As the game rules may change from one place to another, BlackJack Challenge lets you choose among several game settings so you can easily match the rules of your favorite casino tables. 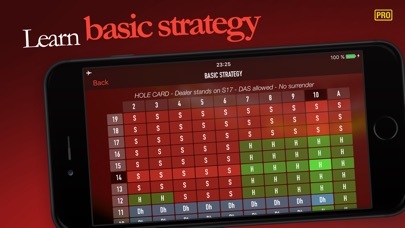 These game features are fully customizable: • H17 / S17 for the dealer hand • Hole Card / No Hole Card (european game) • Double down on 9-10-11 only • Double After Split allowed / forbidden • Surrender allowed / forbidden • Maximum resplits (from 0 to 3) • Initial bankroll (from 50 to 10,000) • Minimum - maximum bet (from 2 to 5,000) • Board color (green, blue, red or purple) PRO FEATURES • Number of decks (from 1 to 10) for Training mode • Deck penetration (from CSM to 80%) for Training mode • Counting strategy (7 options) • Statistics dashboard • Basic strategy tables BlackJack Challenge automatically uses your local currency for figures. 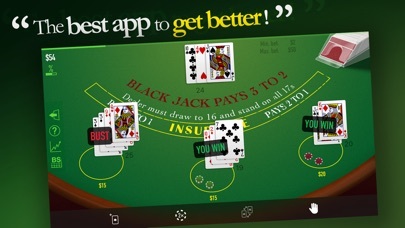 This is a very comprehensive version of blackjack. 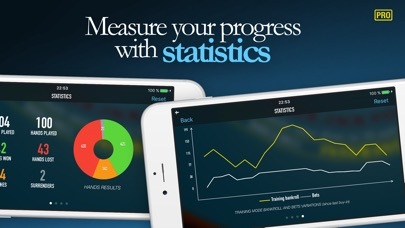 Lots of options and statistical feedback for anyone wanting to experiment with strategies.